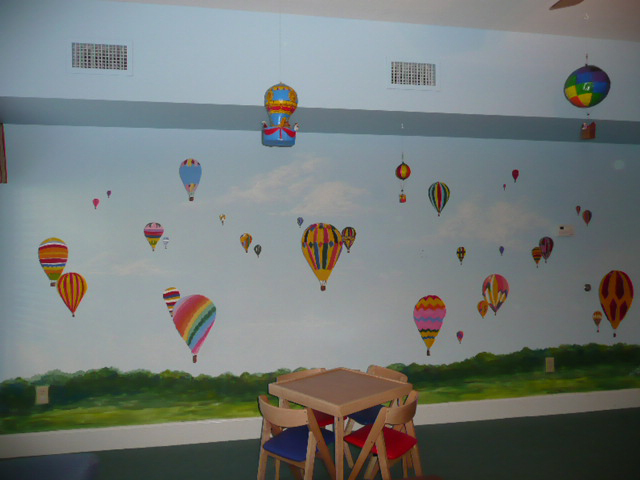 Using my design, about 40 women came on a very cold Saturday morning to the local Hospice Center to paint hot air balloons on a wall in the youth bereavement room. Many of these women had not done anything like this before but took the plunge and put paint on the wall. 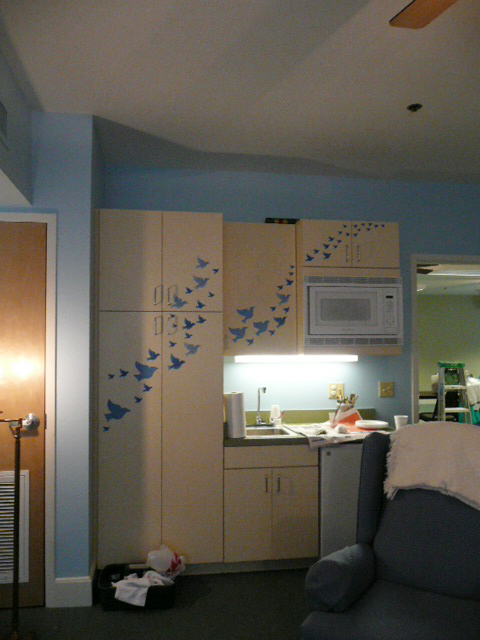 Some were more hesitant and started with cutting out the hospice bird which was to be pasted on the cabinet doors to hide their sterility. 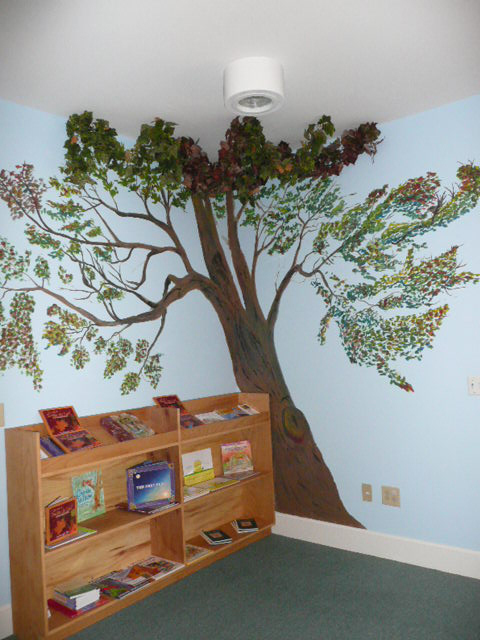 Besides the balloons, I had envisioned a large tree in a corner by a book case so that the children could sit under the canopy of the tree and read. 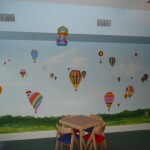 We also had a 3 dimensional artist create 3 hot air balloons which would hang from the ceiling. My idea was to integrate the 2 dimensional with the 3 dimensional concept. 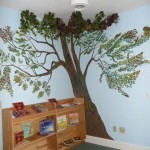 Also we put several strings of leaves draping over hooks on the ceiling over our painted tree. It was great for me to see my ideas come to fruition with this project. It did look just like I had envisioned. My images came from the idea of young people coping with the death of a loved one and thinking of their death as a lifting up from this earth to a more ethereal place. 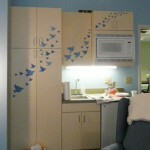 This I hoped to accomplish with the balloons and the flying birds. Then I looked upon the tree in the corner as a peaceful place to rest with words of comfort. To date I have done many murals alone. I have also done a number with volunteer help, mostly young people. I must say that this one has been one of the most rewarding. We have turned a very ordinary uninspiring room into a colorful and lively space but also one that should be comforting to its inhabitants.